Yasmina Khadra is arguably just as well known for the questions surrounding his identity as for what he has written. The nom de plume of former FLN (National Liberation Front) commander Mohammed Mousselehoul is taken from his wife. As an army officer in Algeria, Khadra published under his own name until the regime took notice in 1988 and ordered that his works be supervised by a censorship committee. Rather than comply, he began to publish under the name Commissioner Brahim Llob, the detective-protagonist of his early series of crime novels. In 1997, however, his French editor wanted Morituri published under a name distinct from the novel’s narrator, leading Khadra to use the pen name by which he would come to be internationally known. In 2001 after moving to France, Khadra revealed his true identity, creating a literary scandal that evoked the Western orientalist assumptions implicit in the disappointed desire of the critical establishment upon the discovery that they had not, in fact, been privy to the authentic voice of an “oppressed” Algerian woman. The astonishment was greater still that Khadra had come from the ranks of the military and had been personally involved in the government’s fight against the Islamists during the civil war sparked by the FLN’s cancellation of the 1991 elections after the FIS (Islamic Salvation Front) won the first round. However, more important than Khadra’s dévoilement, as French critics like Alessandra Ferraro have called it, is the gradual thematic shift that can be observed in his work since his move to the metropole (1). His latest novel, The African Equation, is the most extreme example of this trend to date. Khadra’s earliest novels take place within the confines of the Algerian state; it is a highly localized context that he knows well. The superintendent Llob series focuses largely on the institutional corruption of post-independence Algeria, while A quoi rêvent les loups, published in 1999, carries a change in perspective, from a narrator who is part of the state apparatus to one who is a member of the FIS, yet the novel is nevertheless concerned with problems specific to Algeria in the 1990’s. After 2001, Khadra’s subject matter begins to correspond less to the interests of the national Algerian literary market and more to the demands of an international audience. Between 2002 and 2006, he published a trilogy dealing with Islamic fundamentalism in the larger global context, with novels set in Afghanistan (Les hirondelles de Kaboul, 2002), Israel/Palestine (L’Attentat, 2005), and Iraq (Les Sirènes de Bagdad, 2006). In a move further afield of the topics that he has tended to address, The African Equation attempts to depict the enormous disparities between the West and the African continent. Khadra is not a writer fond of subtleties. This is not always a problem; the romans policiers or detective novels for which he initially gained literary fame are not of a genre known for its dependence on nuance and ambiguity. In The African Equation, however, the text’s imprecision and stereotyped one-dimensional characters push the work’s didacticism to the forefront and undermine the literary quality of the novel. The story begins in Frankfurt with the doctor Kurt Krausmann’s in-depth descriptions of his relationship with his wife Jessica, whom he describes as the love of his life, and the idyllic domesticity they share. Shortly thereafter, he returns home to find that she has committed suicide. At her funeral, Kurt is shocked to discover that Jessica took her own life as the result of a particularly mundane injustice: she fell into despair after not being given a much deserved promotion at work. In an effort to pull him out of his depression, Kurt’s friend Hans, an independently wealthy humanitarian, convinces Kurt to accompany him on a trip to Comoros to perform relief work. The premise is already thin, the suicide of little sense to the reader. After the two are kidnapped from Hans’s private boat by Somali pirates, the suspension of disbelief required to accept the events related in the novel becomes increasingly more difficult to maintain. One of the central problems of passages like these, of which there are far too many to count, is that they essentially accept the same opposition between barbarity and civilization the German is accused of espousing. In substance, this is hardly much different from Hans’s statement to Kurt uttered immediately after they are taken prisoner. In reference to their attackers, he states: “The life of a man and that of a mosquito is the same for them. These people are of our time, but another age” (Khadra 58). Kurt’s repeated assertions that Africa possesses a special brutality and savagery are, for the most part, reinforced by the text’s African characters. That these characters make obscure references to an unspecified revolutionary cause (itself at odds with the equally present position that the hostages have been taken exclusively for ransom money) and the violence of colonial history does little to disrupt the binary established by the text. A third hostage, the Frenchman Bruno who has spent the better part of his life on the continent, further solidifies the caricature with his incessant attestations of Africa’s unique impenetrability to all but the initiated. Ultimately, the protagonist finds that his captors have inexplicably brought him to Darfur. This is nonsensical, but in the text there is no distinction between Somalia, the Sudan, Ethiopia, Djibouti, or Chad; Africa is Africa. Red Cross worker: “In Darfur." My adam’s apple leapt in my throat. It is no more likely that Khadra’s audience will be unaware that Darfur is located in the Sudan than a German medical doctor would be. But this is in keeping with much of the novel, the pedagogy that drives the text is often just as simplistic and crudely painted. Regardless that the novel ends with redemption, the consistent portrayal of Africa as a land of brutality and miracles, of violence and supernatural events, even of sanctified laughter in the face of tragedy, stands to eclipse the real specifics of history and further set the region apart from the rest of the globe. Finally, the phrase "L’Afrique, c’est ça!" reiterated throughout the text gives the people of the continent as Khadra imagines them little humanity. (1) See Goodman, Robin Truth. Policing Narratives and the State of Terror. Albany: State University of New York Press, 2009. pg. 121-143. All translations by Gretchen Head. 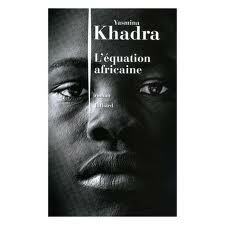 L'Equation Africaine by Yasmina Khadra. Juillard, August 2011. Gretchen Head has a PhD in Arabic literature from the University of Pennsylvania and is currently affiliated with Amideast in Rabat, Morocco. She has published articles and reviews in Akhbār al-adab, Arab Studies Journal,Jadaliyya Ezine, The Lebanon Daily Star, and The Journal of Arabic Literature.